A lot can happen in ten years, but for the families of the six Red Caps killed in Iraq time has in many ways stood still. It was June 2003 when six Royal Military Policeman were murdered by a mob in Majar-al Kabir while trying to train the local force after the fall of Saddam Hussein. 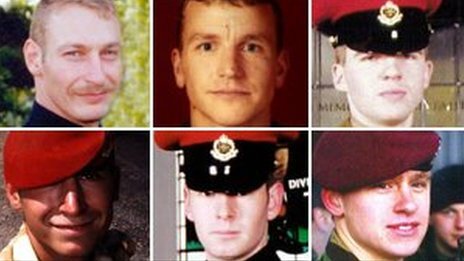 Since then, the familes of Cpl Simon Miller; Cpl Paul Long; Cpl Russell Aston; LCpl Ben Hyde; LCpl Tom Keys and Sgt Simon Hamilton-Jewell have tirelessly campaigned for those responsible to be brought to account – and for the Ministry of Defence to recognise its failings during the incident. I grew up in the same town as Simon Miller’s father John and met him soon after the deaths while working for the Evening Chronicle. Together we produced a series of articles to try and keep the men’s deaths in the spotlight. It’s clear from the amount of attention these receive on this site that the deaths still arose interest and sympathy. In the years that have followed, the British public has started to hold its service personnel in the same regard as the US with the rise of groups such as Help for Heroes. It has also grown wary of jumping into foreign adventures without considering the consequences, as we are seeing today with the reluctance to get involved in Syria. But while Britain has been contemplating is position in the world, the six families of those killed in Majar al-Kabir are still waiting to find satisfaction. There was an inquest in 2006 that found the soldiers were unlawfully killed. They were also not carrying enough ammunition and had not been equipped with satellite phones to call for help in the remote Maysan province. The following year the family pleaded with the Iraqi government to investigate the killings. An arrest warrant was drawn up but charges against two men were dismissed in 2010. By this time, Britain’s adventure in Iraq was long over and it seemed the deaths would fade from memory. However, that would discount the determination of the families involved. Ten years after their relatives were gunned down their relatives are calling for a fresh public inquiry into the deaths. They are also considering suing the MoD in the Supreme Court for the perceived failings. It appears unlikely the calls for a fresh inquiry will succeed in these austere times. The MoD says the matter has already been investigated. Also, since the Red Cap’s deaths, we have already had the Chilcot, Hutton and Baha Mousa inquiries covering Britain’s time in Iraq. But, however much time passes or officials wring their hands, the six men in their 20s and 30s – who were playing football with the locals before they were set upon – must never be forgotten.